Cheesecake is the dessert I used to make a lot when I was younger. 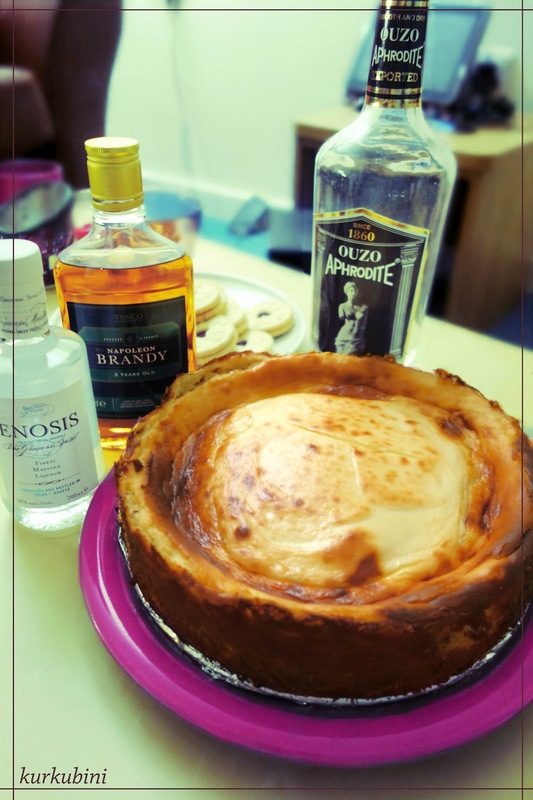 Giotis was the first Greek brand to offer boxes containing semi-made ingredients and recipes for cakes and cheesecakes. A similar international brand is Betty Crocker. As a teenage girl it was exciting to bake something in just 15 minutes and succeed in it without any effort. It also felt great to get applauds from guests when they tasted the finished good. I know what you are going to say. But come on! You were basically handed the dessert ready made so how could it go wrong? Surprisingly even though these recipes were easy to follow few people couldn’t even get those right. Even though the brand offered other types of desserts in the same concept, such as tiramisu, mille-feuille, black forest cake, I always chose the cheesecake. I am a huge fan of mixing sweet and sour flavours to the point that my family is really worried about my taste. I won’t go into details here but the food combinations I come up with are sometimes very extreme! Now when it comes to recipes the variations are in relation to whether you prefer a baked or non-baked cheesecake, vanilla cheesecake with a sort of fruity topping or a flavored cheesecake. After trying a few different recipes I have realized that I am a bigger fan of the baked cheesecakes and I would only make a non-baked one if I didn’t have as much time to prepare it. This recipe is a very simple and basic vanilla cheesecake recipe. When I served it I asked my friends whether they would like a fruity topping and their response was no. They loved it as it was! It’s true that with this recipe you achieve really good cream consistency and a very balanced and original smooth taste. You can use it as a basis and then decorate it with different types of caramelized fruit or toffee and coffee sauces. Preheat the oven to 180 C and in a bowl crash the digestive biscuits. Melt the butter and pour it on top of the crashed biscuits. With your hands squeeze the biscuits and butter to get a consistent mix. Place the biscuit mix on the base of a 25cm springform and squeeze them to get a firm base. Put in the oven and bake for 10 minutes. After removing the sprinform from the oven turn it to 200 C.
With an electric mixer start whisking the cream cheese and as you go slowly add the sugar and the flour. Once well mixed add the eggs one by one and beat until they are well incorporated. Finally add the zest from the lemon, the vanilla essence and the double cream. Keep beating until the mixture is smooth. Pour the mixture in the springform and bake for 45 minutes. After 20 minutes check your cheesecake and make sure that the top is not getting too brown. If it does cover with kitchen foil and continue baking for 25 minutes. After you take it out of the oven let it cool and then put it in the fridge. Some advise to let it cool for 2-3 hours before serving. I love eating it when it is in room temperature so I don’t always cool it before I serve it. It is up to you! I will be coming back to give you more ideas on different cheesecake toppings. For the moment you can enjoy it as it is! I can guarantee it is delicious!